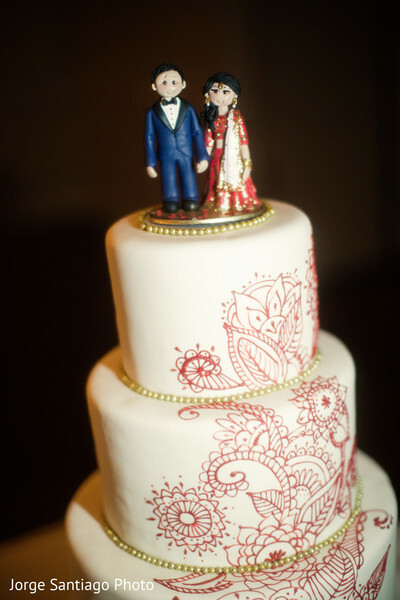 We’re wrapping up the lovely wedding of Mrudula and Akash at the Hilton Garden Inn Pittsburgh/Southpointe. 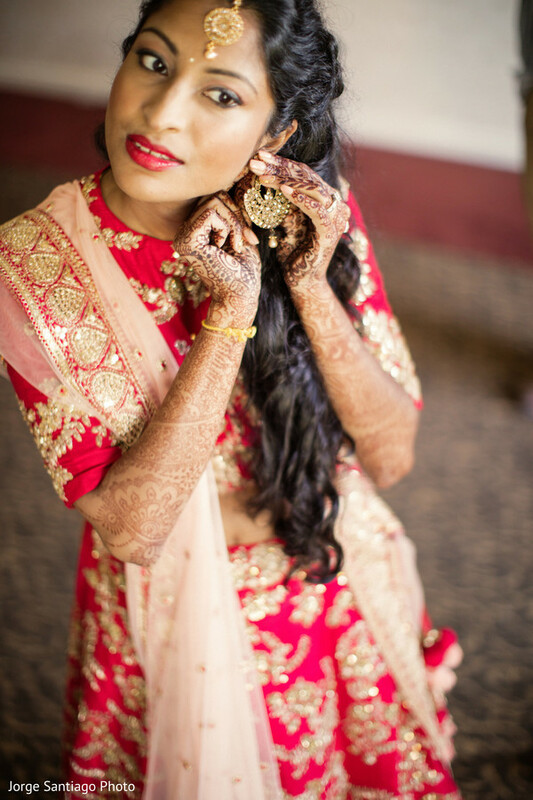 For the reception extravaganza, the bride was spinning with royalty in a red and gold wedding lehenga fit for a queen. 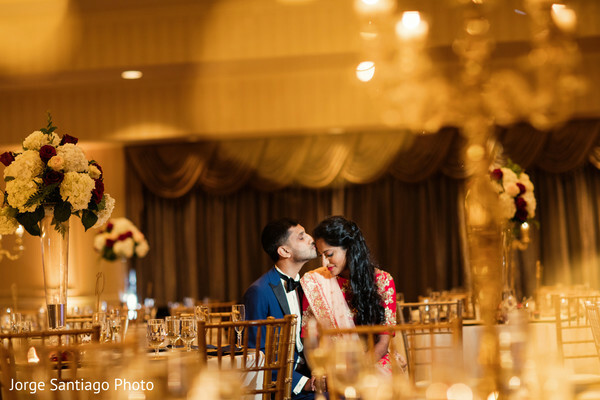 Abhishek decked out the venue with a sparkle and lavish details, such as golden uplighting, shimmering candelabras, and fresh white and orange blooms that certainly set a romantic mood. 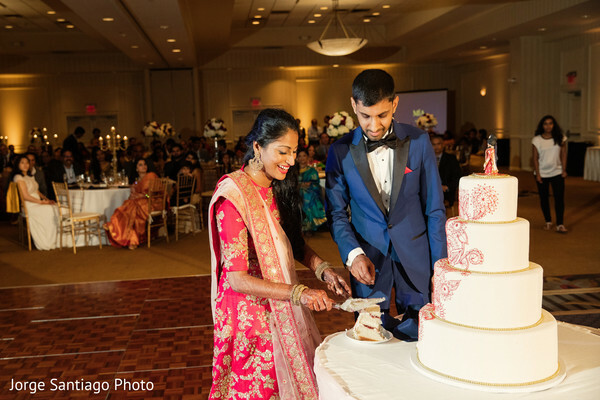 The reception food by Amiya Restaurant was pure decadence, ranging from South Indian to Gujarati to Mediterranean to Indochinese. Our mouths are watering thinking of all the delicious options! As always, the talents from Volcanik Entertainment were on the turntables churning out the latest and greatest hits, and guests crowded the dance floor all night long at this banging bash. We’re sure Veda Films captured some exhilarating live action footage from this special night. And hats off to Studio Sheen Event Planning for orchestrating all the intricate details to pull off this fairy tale bash. We’ve assembled all the snaps by Jorge Santiago Photography in our full gallery, so sit back, relax, and enjoy! 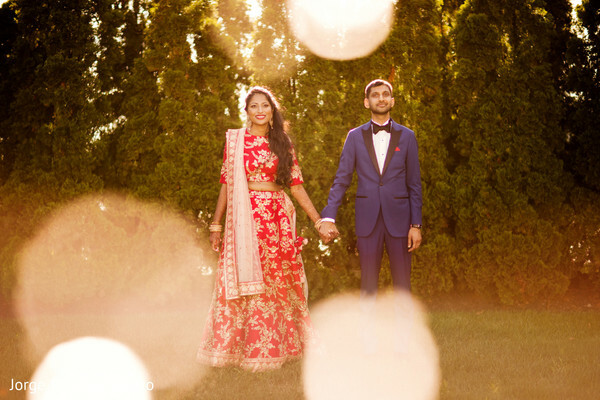 "The epic five day wedding of Akash Gadani and Mrudula Kudaravalli was a mix of traditions from Gujarat and Andhra Pradesh with a modern twist. Mrudula held her Pendlikuturu and Mehendi functions at her residence, while Akash’s family did the Graha Shanti and Ganesh Puja at theirs. 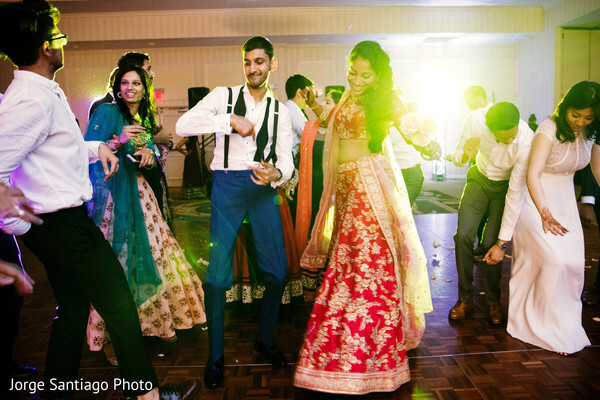 The main wedding festivities started with a glamorous Moroccan themed Garba night. Moroccan style pillows in the foreground with a paisley adorned setup on the side which made for spectacular pictures. 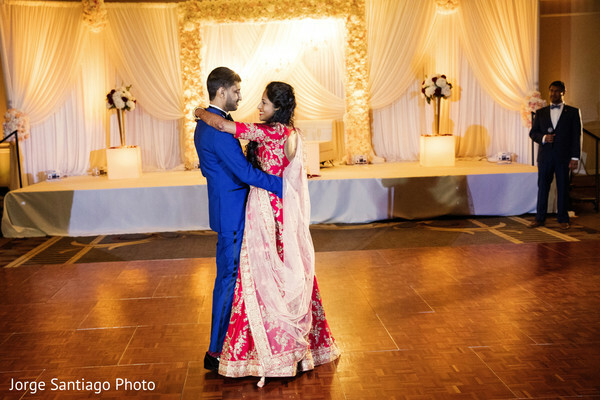 The focal point of the wedding was the transformation of the gazebo at the venue into a traditional mandap with a modern twist with floral curtains and a chandelier made out of over a thousand roses. 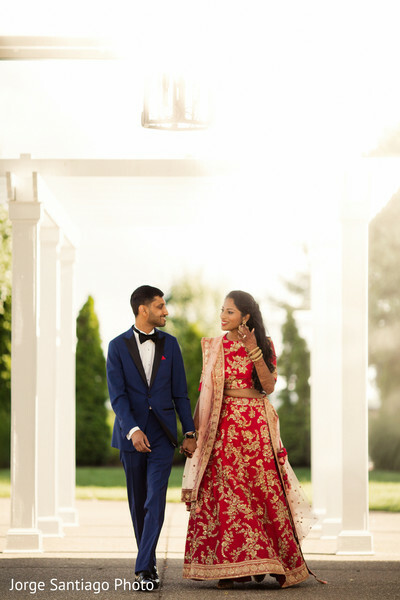 The groom's outfit incorporated both elements of Southern and Northern India which represented the Telugu and Gujarati heritage of the bride and groom. The southern elements included a dhoti and saafaa made out of a hand picked kanjeevaram silk saree and the northern elements of a custom-made sherwani made from gold-threaded cloth by his uncle. The bride wore two kanjeevaram sarees which were both selected on a personal trip to Chennai. The first one was tied in the traditional Telegu manner adorned with a classic gold belt along with multiple gold necklaces passed down from her mother. The second saree was given to her by Akash's mother and was tied in the traditional Gujarati manner signifying her becoming officially part of his family. 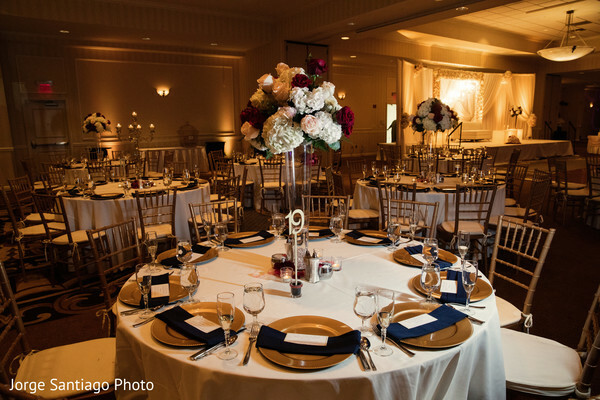 The couple did not leave anything out when accommodating their guests. They made sure that everyone was stylish with white sunglasses to protect their guests' eyes from the sun during the beautiful outdoor wedding. There was also a donut bar from a Pittsburgh staple known has Peace Love and Little Donuts which was the star of the breakfast spread. This segues into the food during all of the wedding festivities which was expertly provided by Amiya Restaurant of Jersey City, NJ. No cuisine was left out with a mix of both vegetarian and non-vegetarian dishes. This ranged from South Indian and Gujarati to Mediterranean and Indochinese. The guests were treated to innovative presentations of food during the garba night and cocktail hour. The dinner at the reception had a plethora of options for all different tastes and was capped off by a delicious dessert spread put out by the Hilton Garden Inn pastry chef, (name). 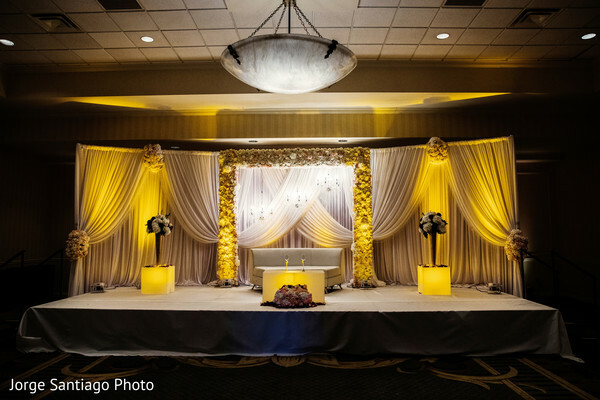 Speaking of the reception night, the stage backdrop was studded with roses with chandeliers in a cascading fashion. 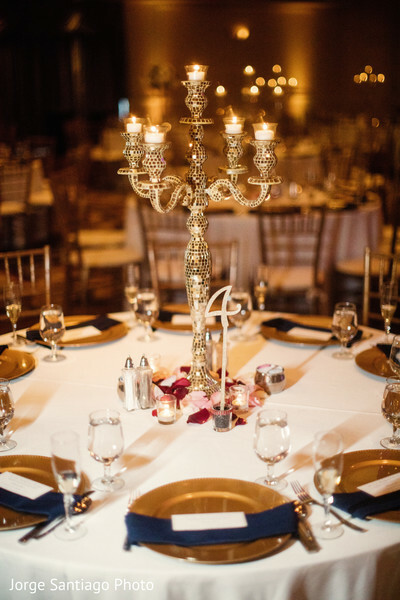 The mix of floral and candlelit centerpieces were perfectly picked by the bride to go along with the theme of the night. DJ Rah and his team from Volcanik Entertainment had the dance floor jamming the whole night. 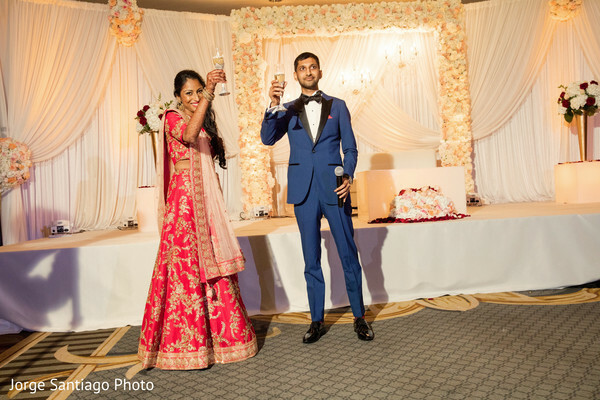 This was a memorable night and concluded an expertly planned weekend of wedding festivities." Have a wonderful day Maharanis!